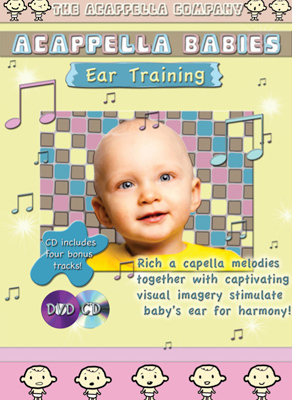 The Acappella Babies DVD series is designed to provide children ages 3 months and up with early exposure to vocal melodies and harmonies that promote ear recognition of the language of music. Along with the recognition of music, the DVD series will expose them to the world around them in a nurturing way. Complex harmonies are paired with visually stimulating imagery to encourage learning through sight and sound. Interaction from the earliest of ages is highly recommended. Every Acappella Babies set includes a DVD and CD. The DVD allows parents and babies to share the world around them with each other and others around. Sites of nature, animals, and colors paired with different ranges of motion can open up a whole new world. The CD offers the opportunity to play and share things together everywhere you go. No matter what you are doing you can share the sounds of Acappella together. The soft sounds may be played in the car, during play time or when settling in for bedtime. Similar to Baby Einstein.